This thing is "big." 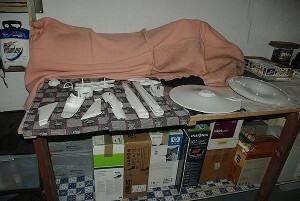 Here's all of the main hull sections laid out for inspection and trial fitting. Lower half of the Primary. 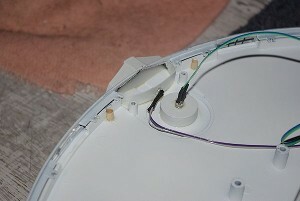 The opening was made above the Dorsal Neck fitting to allow passage of wiring for the LED system. 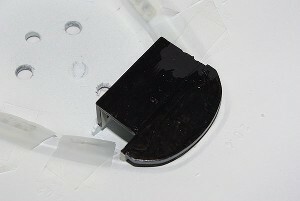 All exterior surfaces were masked to prevent flat-black paint from getting to them. 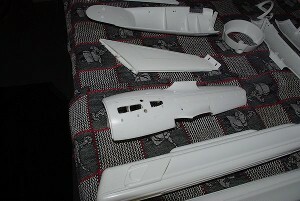 The exterior will eventually be Pactra Pearl White. 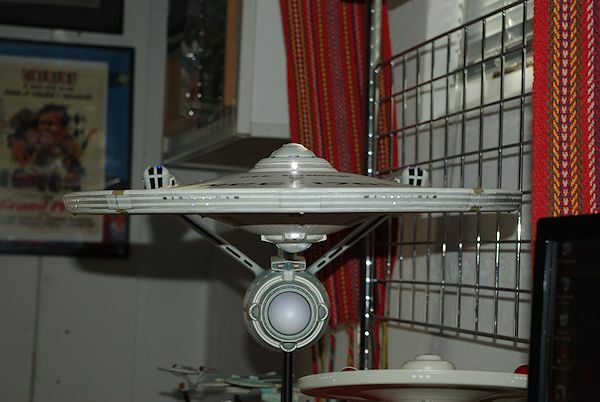 Some smaller pieces needed to be hand-painted for light blocking, especially the Deflector Dome, as the white plastic will diffuse the blue interior light. 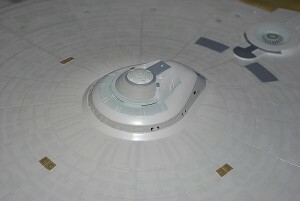 Likewise, the Impulse Engine Reactor Dome detail was also done in Duck Egg Blue. 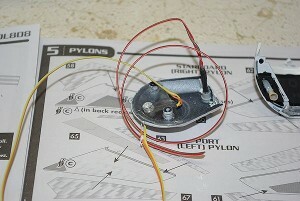 Instructions for the VooDoo FX LED system. 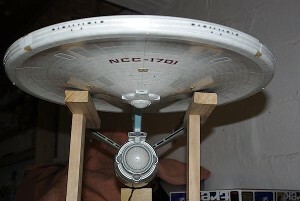 From here on out, this book paces the construction of the model. 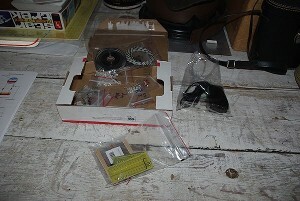 They provides a complete system, including all parts and wiring needed. 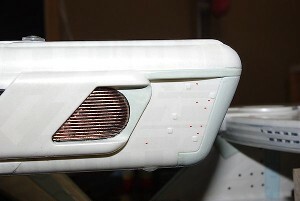 The intake grilles are fitted into the outside warp pod half. Interior light-blocking painting was added. 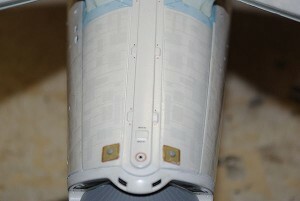 A fit-check and detail painting of the pod-tip Nav Thrusters. 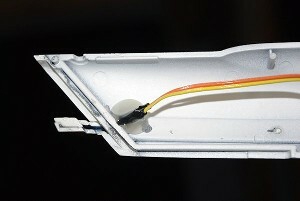 A piece of clear plastic goes in here direct the light from the yellow LED. 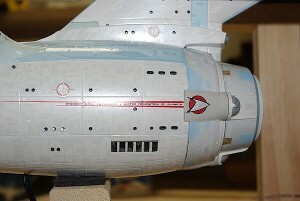 Exterior detail painting of the upper Primary Hull, including Nav Thrusters, Phaser Banks, access panels and Impulse Engine locations. 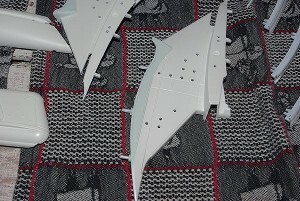 The Duck Egg Blue interface panels on the top of the Dorsal Neck were painted. 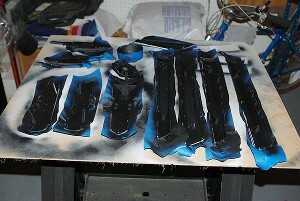 The Primary lower half got detail painting and a full set of "azteck" decals. Handling must be done carefully once the aztec panels are applied. 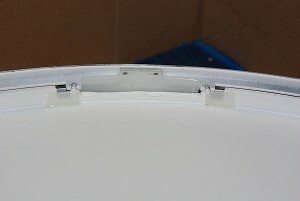 The edge sections of the upper Primary are attached to the hull. These must line up precisely. 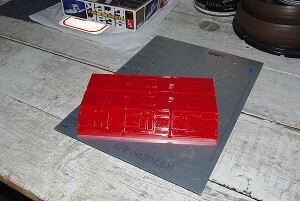 I used sheet styrene to fabricate the housings for the Impulse Reactor (blue) and the Impulse Engine (red). 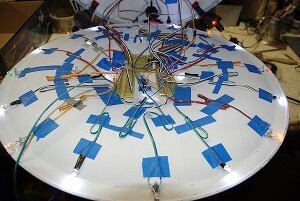 Two LEDs mounted into the Bridge Dome. 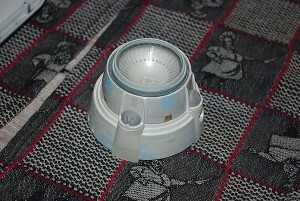 One lights the three base "cells" and one is the upper Nav Strobe. 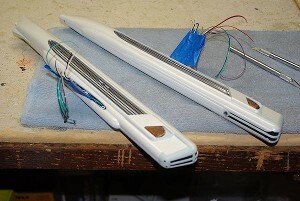 Pre-assembled blue light tubes for the Warp Pods. 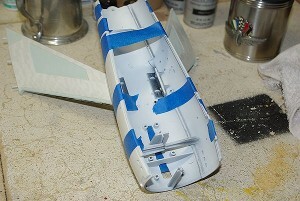 The engine supports are channeled inside to allow wiring passage and glued together. 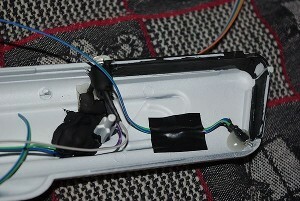 The bottom Nav Strobe and the fantail beacon LEDs are added to the lower Secondary. 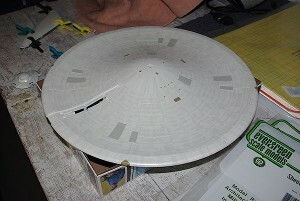 After aztecking the supports, assembly of the major section of the Secondary Hull begins. 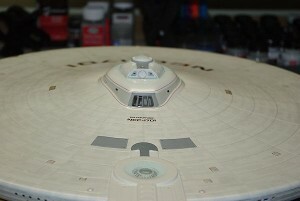 Detail painting and azteck decal panels were added to the lower half of the Secondary Hull. 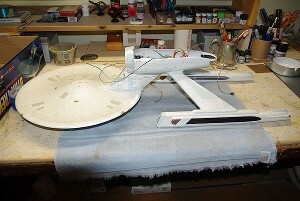 The Bridge Dome was installed and all aztec panel decals were placed onto the Primary Hull upper half. 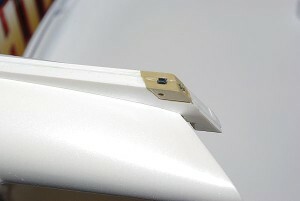 The special aztek panels for the neck/hull interface were applied. 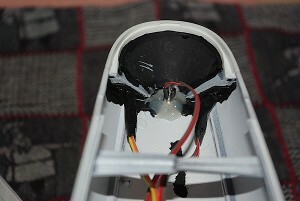 The two white support spotlight LEDs and the two yellow Dorsal spotlight LEDs were added, tested and light blocked. 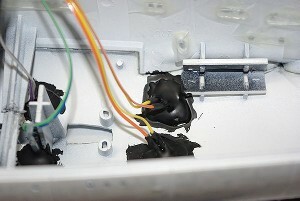 Hot-melt was used to lock the LEDs down. 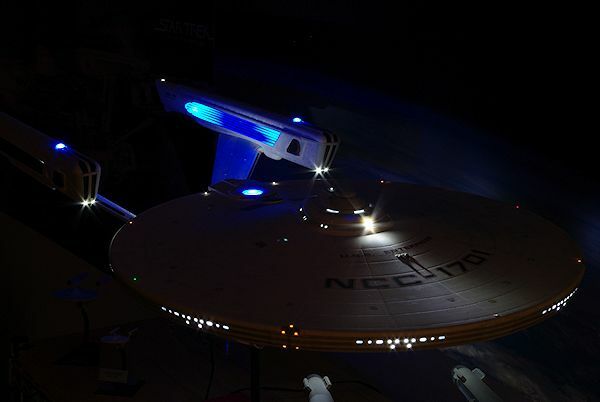 A yellow LED is now located on the aft Pod Nav Thruster location. 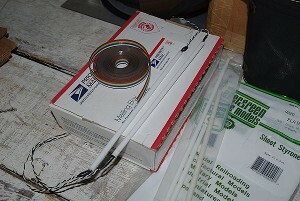 Light blocking is critical here, especially prior to assembly. 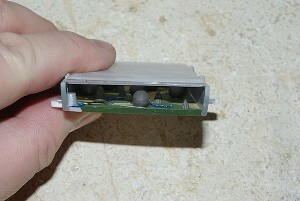 An inward facing pod half with the light tube installed. 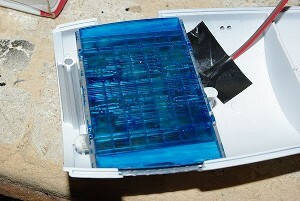 The tube has a blue LED at each end. 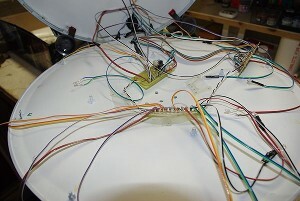 The wires were secured to the assembly bosses to maintain alignment. 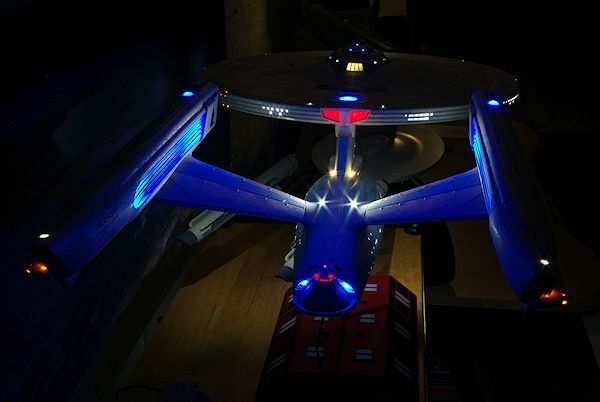 The Deflector is lit by four blue LEDs. 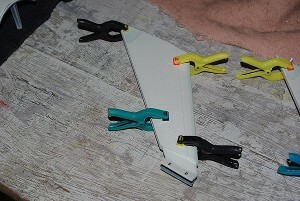 The support is a mirror-finished paper panel cut to fit the hull front. 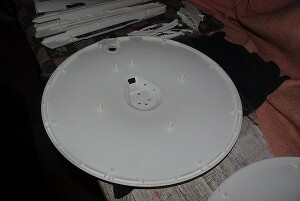 The hull interior forward of the plate was light blocked. 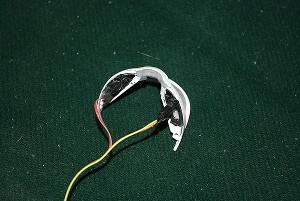 The support lead-wires were pulled through the supports and wired into the circuit. 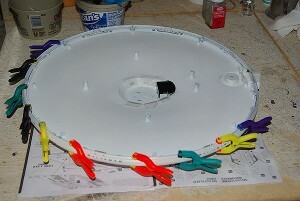 Then the lower Secondary Hull section was "wired in," attached and cemented in place. 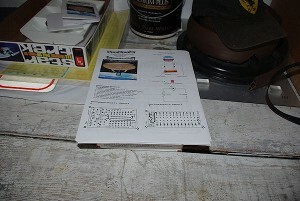 Three boards were installed here - two distribution boards ad one timer control board. 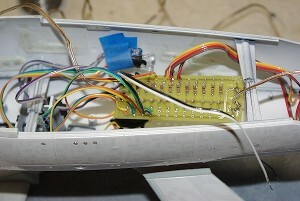 The T/C board works the white strobes and NAV beacons. 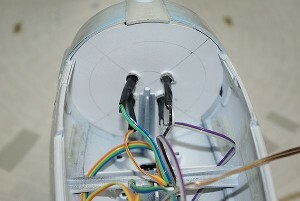 The LEDs are pre-wired with leads and placed into the hull, then wired in. 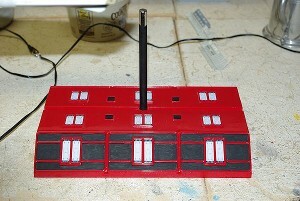 Whites for the windows, yellows for the thrusters, reds and greens for the port & starboard NAV beacons. 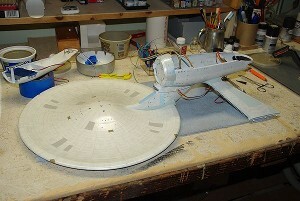 Once all LEDs were checked, the hull was brought into place and cemented. Care was taken to assure that all seams locked together. 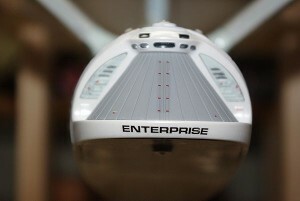 Primary Hull, rear view decal placement. Impulse Engine area decal placement. 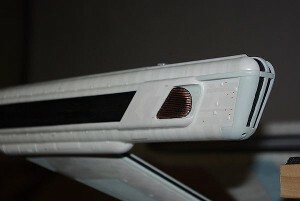 Warp nacelle rear decal placement and detail. 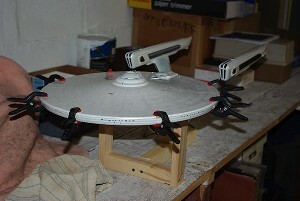 Supplied display stand, intended to represent "Space Dock." 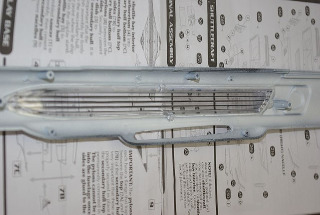 The upper half of the Primary Hull - about 16-1/2 inches in diameter, the finished model will be almost 36 inches stem to stern! 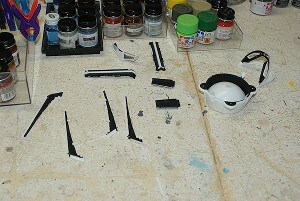 Top and bottom of the Secondary Hull, and some of the warp engine pods and supports. 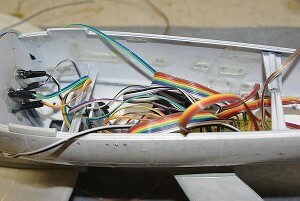 Wiring must run through the supports from the engines to the Secondary Hull. 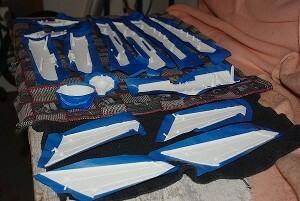 All hull interior surfaces received a white primer, then a coat of flat black for "light blocking." 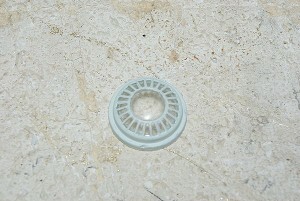 The detail of the clear exterior Deflector lens was done in Duck Egg Blue and Camouflage Gray. 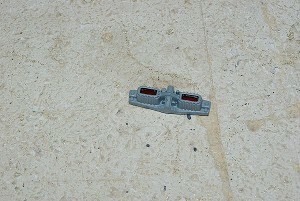 The clear red Photo Torpedo Bay facing was done on both inside and out with Neutral Gray, except for the rectangular tube openings. 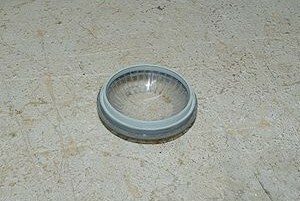 They were left open to allow interior light through. Interior detail of the Arboretum. 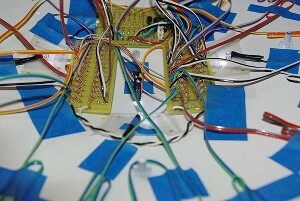 The LEDs are sorted by size, color and shape. 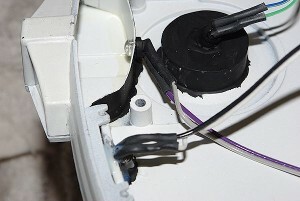 The system provides power distribution boards and a timer control board for the strobes. 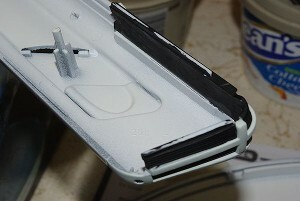 1 mm wide black stripping tape was used to do the rib detail on the clear inner warp pod grilles. 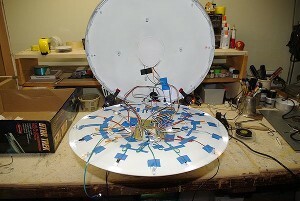 After the pod fit checks were completed, we disassembled them in order to begin the installation of the lighting. 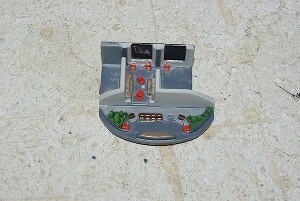 The exterior window and interior of the Officer's Lounge is installed into the interior of the upper Primary. 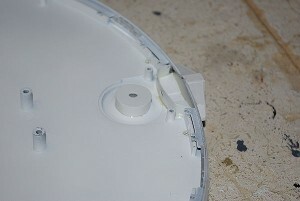 The sides were left open to allow "ambient light" to illuminate the interior. 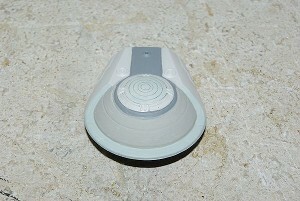 The Bridge dome was detailed in Duck Egg Blue, Camoflauge Gray and Neutral Gray. 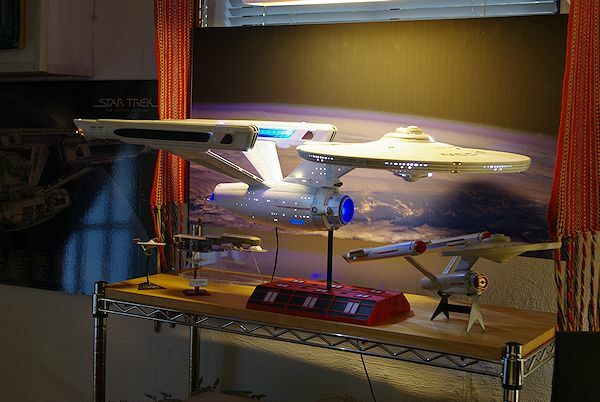 All interior surfaces were light blocked. 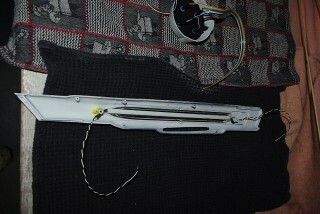 The clear plastic lower window sets are installed. 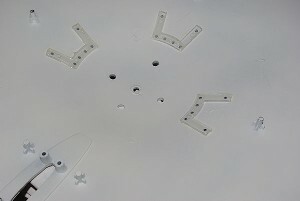 The white plastic inner wall that lies in front of each window "bay" must be removed, and a section of translucent plastic added for light disbursement. 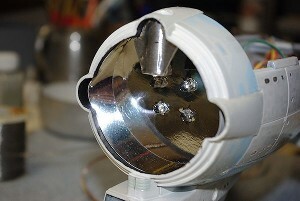 The LEDs were trail fitted into the chambers and electrically tested before cementing. 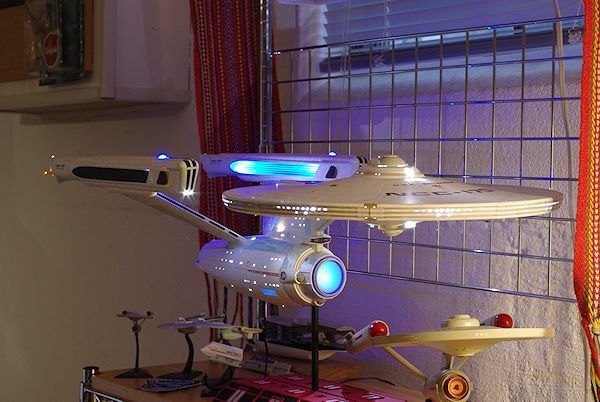 Blue LEDs are added to the fantail of the Shuttle Bay. 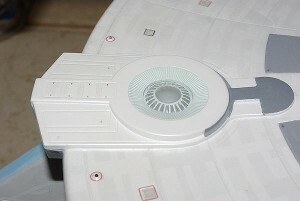 The forward section of the Deflector come together, with full detailing and aztec panels. 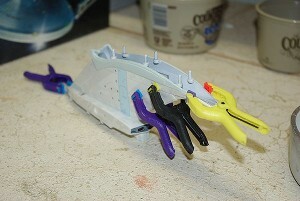 Light blocking is done to the Impulse sections and the two Nav Strobes. The Arboretum deck is nested into place. 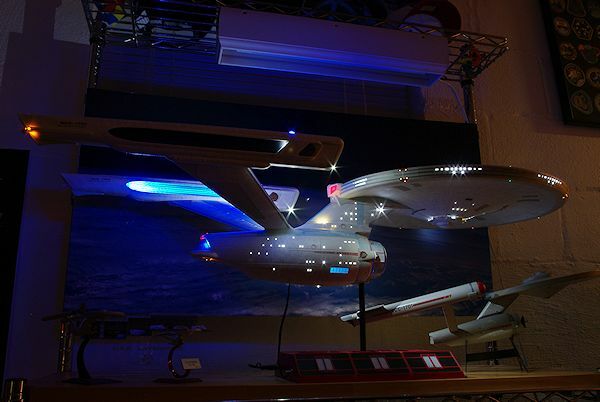 the upper clear panel was painted clear blue to allow ambient light to enter and simulate "sky." 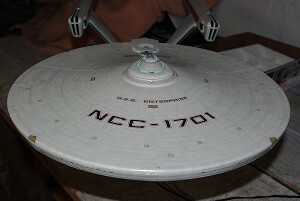 The sections of the Dorsal Neck were aztecked, then assembled into a unit, with the Photon Torpedo Bay panel in place. The Dorsal Neck was assembled onto the Secondary major assembly. 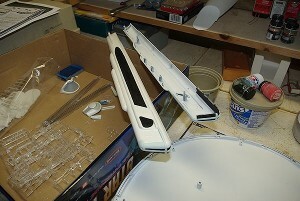 The Shuttle Bay Doors and fantail section were assembled. 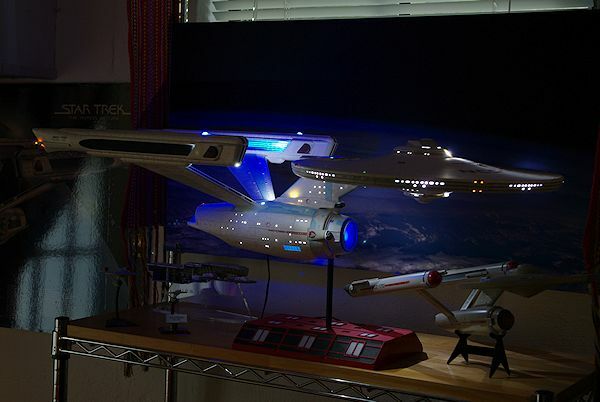 The central LED is red and illuminates the Shuttle bay control room. 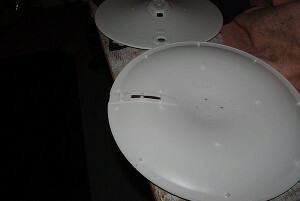 The Secondary assembly was placed onto the Primary lower half for initial assembly and electrical wiring. The first of three distribution boards is installed. 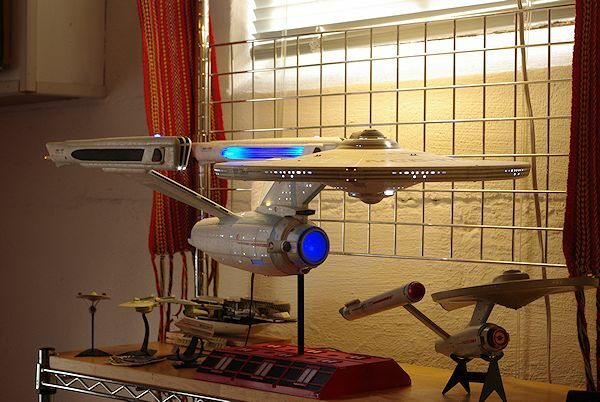 This one accepts external power, does all of the Secondary and warp pod lights and sends power to the Primary for further distribution. 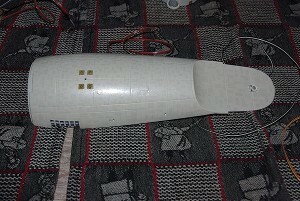 Same pod half, forward, with a white LED for the side lens, a blue for the reactor dome and a white for tone of two forward spots. 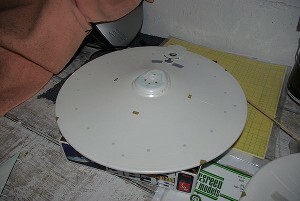 A separate ring of mirror paper was added to increase overall light towards the Deflector. 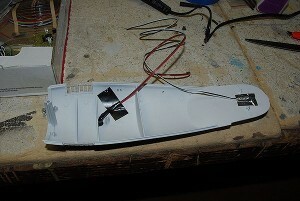 Along with wiring the pods, four white LEDs were added to light the Secondary Hull's interior. 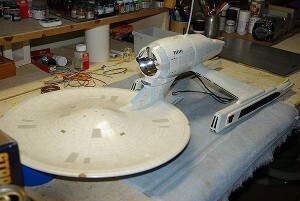 A special wooden fixture was made to support the model during final electrical work and assembly. Because of the number of LEDs in the Secondary, Pods and Dorsal, some need to come up here for power. 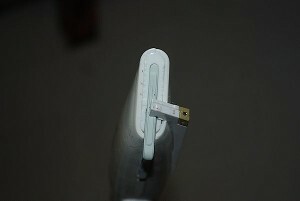 The whole of the Primary hull system is wired from here. 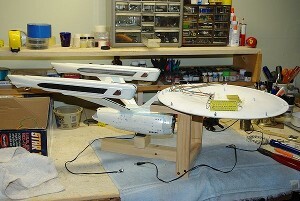 The upper half of the hull is supported and wired in. Light checks are always done before proceeding. 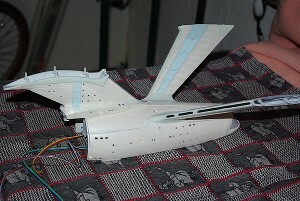 Final upper hull decal placement. 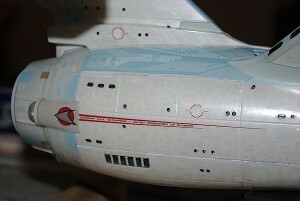 Primary hull, lower side decal placement. Fantail & door decal placement. 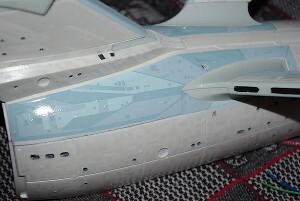 Upper Secondary hull decal placement. 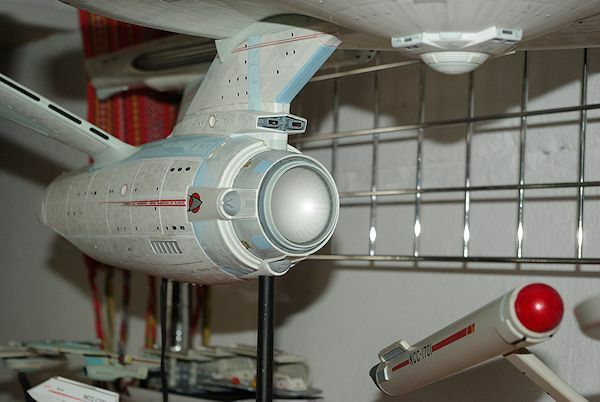 Warp nacelle detail. copper brushed over edges of flat black grille areas. Each red decal is a separate item.